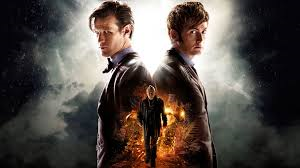 Rating: Worth the wait for any Dr. Who fan. Great starting point for anyone new to the franchise! So, I had skipped big slices of the last two seasons of Matt Smith as the 12th Doctor. Bringing me back to the fold was the 50th Anniversary episode featuring John Hurt as wartime version of our venerable Time Lord. The other big attraction was David Tennant revisiting his incarnation of the Doctor. What had converged these three iterations of the Doctor all together, a doomsday device called “The Moment.” On the last day of the Time War, this weapon was the last unused military weapon available from the Gallifrey archives to thwart a siege of Daleks on the Gallifrey home world. 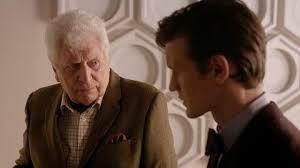 Having developed consciousness, “The Moment” had decided to punch holes in space time continuum in hoping to avert John Hurt’s Doctor from performing a horrible genocide on Gallifrey. With unfolding plot with all three Doctors in tow, they had come across another earthbound threat of an alien race called the Zygons. In finding a solution to mitigating this invading force, the 12th Doctor had realized another means of avoiding the genocidal power of “The Moment.” From this epiphany, the audience had received a phenomenal “save the day” finale working in various versions of the Doctor. In setting up Matt Smith’s second to last episode, Dr. Who fans had also received an unexpected cameo via a heartfelt performance by one previous Doctor in actor Tom Baker. The last 10 minutes of “Day of the Doctor” had provided so much raw emotion, I had literally jumped out of my seat in joy during a visual homage to all the previous Doctors. Uncertain anyone else had felt the same but, what a great means of indoctrinating me again as a Dr. Who fan. For folks missing the broadcast or a DVR, you can pickup this episode on iTunes. This entry was posted in Cable Television and tagged 50th Anniversary, BBC America, Cable Television, David Tennant, Day of the Doctor, Dr. Who, Gallifrey, John Hurt, Matt Smith. Bookmark the permalink.